We are a company, specializing in the production of mechanical machines and devices for rail vehicle maintenance and repair facilities worldwide as well as in providing integrated services in implementation of advanced PLM systems as DASSAULT SYSTEMS Certified PLM Reseller and a partner of other engineering companies on the Polish market. 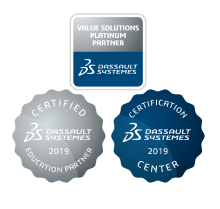 Within the frame of this cooperation, we deliver the integrated services in the implementation of the advanced PLM systems including support and training courses. • Engineering Systems Division dealing with distribution and implementation of PLM Systems. During all years of our activity we have developed ourselves from a design office to a company supplying complete Customer-orientated solutions both in production of special machines and technological devices for rail transport maintenance and integrated services for complete implementation of PLM systems. Our team, due to our joint Customer-focused vision, professional attitude to work, experience, skills and perfect inside and outside communication makes KOLTECH supplies products which are not only exactly tailored to Customer’s expectations and needs but are somehow unique from all other solutions.